Many countries have invested in green public transportation as of late, with both the UK and the US implementing trial electric bus services. However South Korea set to surpass both nations as the Seoul Metropolitan Governmentrecently rolled out the world’s first commercial all-electric bus service! 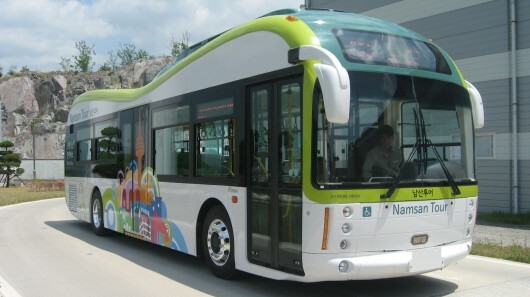 The electric bus service was developed in partnership with Hyundai Heavy Industries and Hankuk Fiber. The buses were designed to be as efficient as possible — each bus can run up to about 52 miles on a single charge and they have a maximum speed of about 62 miles per hour. The vehicles’ lithium-ion battery packs can be fully charged in less than 30 minutes and they also feature regenerative braking systems that reuse energy from brakes when running downhill. The buses have also been built to be as green as possible. They are made from a carbon composite material, instead of iron plates, which considerably reduces the vehicle’s weight while reinforcing durability. The development is the first step in Seoul’s ‘electrification’ of their bus services — the government has announced that half of its massive fleet of buses will be electric by 2020. Seoul’s grand plan is to have a total of 120,000 electric vehicles in use within the city by the end of the decade, which will account for 50 percent of all public transport vehicles, 10 percent of sedans, and one percent of trucks and vans. Hi how much do these electric buses cost in British sterling please, many thanks James Kane. Wow... you two are complete downers. Try being more positive... someone somewhere is making a significant attempt to be green. What else really needs to be said? No matter what is already out there S. Korea tends to be more advanced when it comes to technology anyway, their design is probably anyway. @Geosota: exactly what I was going to say. 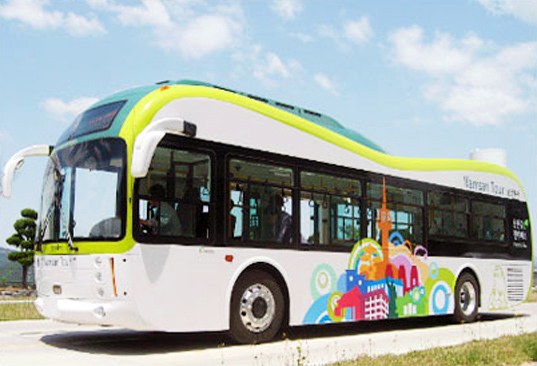 There are plenty of cities in the world still use electric buses, and there are also fuel cell buses in operation too. It's disappointing that so many of these articles are either just reproducing press releases or other websites without any challenge, or are written by people who don't really know enough about the subject matter, or don't have the time or the mandate to actually do some research. The article would, of course, have been fine if it simply said the world's first rechargeable battery-powered bus fleet. Pretty obvious to anyone who knows what they're talking about. Electric busses were common in US cities in the mid-20th century. They ran off overhead power lines like trolleys but navigated traffic like a modern bus. Many countries have invested in green public transportation as of late, with both the UK and the US implementing trial electric bus services. However South Korea set to surpass both nations as the Seoul Metropolitan Governmentrecently rolled out the world's first commercial all-electric bus service!